While there are many advantages of the platform that Netflix pioneered - from being able to stream shows and movies to not having to worry about running up late fees if you forget to turn the tape or DVD back into the store - one of the things I have missed from the past were direct-to-video films. As the drive-in and bargain theaters slowly faded away b-movies needed another outlet, and video stores were definitely it. Honestly, most large studios won't take the chances of putting something with a limited audience in the theater, and many chains won't fill up one of their theaters with something like Bright when it's one more room they can jam a number of people into to see the newest Marvel offering - especially when the movie's director is one of the many responsible for dragging the competing DC universe through the muck. After practically destroying the franchise with Suicide Squad, trying to convince the usual Hollywood machine to back an overly expensive pulp film set in a fantasy world without any backstory or book to promote it is nearly impossible. Throw in a screenwriter that is considered iffy at best, and you have something that most studios would pass on these days. Not so with Netflix. Although this is something that Charles Band would have possibly thrown together for around a million and filmed on a back lot if it was still the 1990s, Netflix threw 90 million dollars at making this come to life, and in the process bringing back the direct-to-video movie, just in a new format. It's not that this is the first movie they have produced in an attempt to do this, but it was the first with enough of a push behind it to make audiences take notice. Daryl Ward (Will Smith) is a Los Angeles police officer in a world contemporary to ours, but much different. The mythological creatures from the past (and from the Tolkien books) are all real, and have to co-exist. Largely, human history is much the same as it is here, only with magic involved and, despite all we do, Elves truly being the ones who run the world. While they live in their own walled-off enclaves, humans go about their own non-magical lives, with all the same old prejudices, plus one extra: Orcs. Orcs chose the wrong side of a battle against darkness 2000 years hence, and have been paying the price for it throughout history. Ward is saddled with first Orcish police officer in the United States, Nick Jakoby (Joel Edgerton), and he is in no way happy about it. It's even worse after Ward is shot and almost killed by an Orc during a robbery, who then escapes when Jakoby pursues him. As Orcs are known for clan loyalties, it is immediately assumed that Jakoby purposely allowed the perpetrator to get away. After recovering Ward is still forced to ride with Jakoby over his objections, and his suspicion that his partner may not have his back makes the interactions even more awkward. Still, they manage to peacefully bring in a homeless man (Chris Browning) who is causing a disturbance by waving a sword around on a street in the Orcish part of town and yelling about the coming of the Dark Lord. As if that wasn't bad enough, Internal Affairs seems to have the same suspicions and has Ward carry a recording device to get Jakoby's confession so they can fire him with cause and avoid a PR nightmare for appearing racist. Ward reluctantly agrees after having his job threatened. Meanwhile, federal agents Kandomore (Edgar Ramirez) and Montehugh (Happy Anderson), from the Magic Task Force, arrive to question the man that was arrested, who turns out to be a member of the Shield of Light, an underground organization meant to protect the world from the Dark Lord's eventual return. The agents are concerned that a renegade Elf faction called the Infernii, who are actively pursuing the return of the evil wizard, may be having an internal conflict that the Shield of Light may be aware of. On Ward and Jakoby's second trip out, Ward attempts to get his partner to fess up to what happened, but it is interrupted when a call comes in. When the arrive at the location they immediately come under fire. After killing the gunman they find a number of people inside slaughtered by magical means. They also discover the Elf Tikka (Lucy Fry), who happens to be in possession of a magical wand stolen from her Infernii leader Leilah (Noomi Rapace). Ward does what he is supposed to do and calls in the incident, but when his colleagues arrive they conspire to kill him and Jakoby and take the wand for themselves. In order to prevent this Ward shoots the other cops, but just finds himself in more danger as rumor of the wand has reached an Hispanic street gang called Alta Mira, led by the crippled Poison (Enrique Murciano). Also pursuing them is Leilah and her henchmen. While a binding spell on the wand prevents them from escaping by normal means, the trio try to make it out on foot, eventually resulting in crossing the Fogteeth Clan led by the Orc Dorghu (Brad William Henke), who decides to have Ward and Jakoby killed. Jakoby himself, because of filing his tusks and joining the police force, is considered a traitor to his race and not a real orc. This changes when Tikka uses the wand to bring him back to life. With the new-gained respect from the Orcs, the partners seek to heal Tikka from her effort in using the wand as well as get it in the proper hands of the authorities before it can cause more chaos. Meanwhile, there are some unresolved issues between Leilah and Tikka, as well as a bit of prophecy that may directly affect Jakoby and Ward. 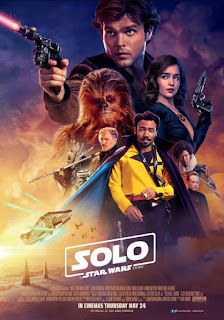 While it is nice seeing a movie that is not part of a larger franchise (at least not yet), not bound to a popular book and largely being a new creation, the truth is that despite all of its fantasy trappings Bright doesn't bring anything too original to the screen. The concept of using an imaginary race to stand in for oppressed people in the real world was already done with Alien Nation, which famously spun off into a television series that was much better than the movie itself. As for the majority of the film, it's a "survive the night" type film in the vein of Judgment Night or The Warriors. That said, it is executed rather well. While there is certainly much room for criticism in this movie for not being the most original piece of cinema either, hearing it called "incomprehensible" and "unnecessarily complicated" just seems strange. Maybe it's because I am familiar with numerous books in which fantasy is portrayed in modern times (the concept itself is far from original; it just hasn't really been made into a successful live action film before), but I found that just dumping the viewer into the world without spending the first 10 minutes of the movie loading the audience down with backstory worked better than the alternative. There is an accompanying video up on Netflix that further explains the history of the world, but it's best watched if you have already seen and liked the film. It's like an appendix to a book in which you get a little more to flesh things out after you have already accepted what's in front of you. Will Smith plays Will Smith as a cop, so there's really not anything different here than there has been in his previous performances. It's not some ego-stroking turn like After Earth, so nothing to worry about there. It is Joel Edgerton who understandably gets to shine here, playing a creature that is brought up in a tough-guy, clan environment that he feels unconnected with, but living in a world where it is impossible to connect with the others that live in it as well. Noomi Rapace largely looks icily threatening as Leilah does gymnastics and violently murders everyone in her path. It's still better than most modern villains. I would love to see a movie focusing solely on the exploits of Kandomere and Montehugh, as the Elf/Human partnership portrayed by Edgar Ramirez and Happy Anderson successfully mirrors that of Ward and Jakoby. Don't really need their whole backstory; just want to to see them in their own function doing what they can to make sure magic does not blow up the world. As much as I enjoyed it, I will admit that there is not one angle here that we have not seen in a fantasy film, buddy cop or siege movie. Perhaps that is where its biggest fault lies. There were many opportunities to take these cliches, stand them on their head and have fun with them (just not in some cynical self-aware way, I would hope), but instead they are just building blocks for the movie. It's not that there is some weird, half-formed fantasy universe behind it, but the biggest problem for me is that I have seen every element here so many times. I knew every plot twist ahead of time, knew how it was going to end, and even knew right down to who would be killed. It's the problem I run into when October comes around and I watch a whole slew of horror films - I can practically spell out the plot, and even quote dialogue, before it is even uttered, even without having seen the movie, or even a trailer. It just happened that, despite all this, Bright was still enjoyable to watch. As for the racial commentary, it's there toward the beginning, but largely gets abandoned. It's hard to substitute Orcs for African-Americans when it's obvious that African-Americans are still getting, if not the short end, than at least a shorter piece of the even longer stick in this pretend universe. All the same racial problems between humans exist; it's just that, no matter how bad it gets, there are Orcs even further at the bottom. The racial allegories do not truly work any more than they have in Alien Nation, Enemy Mine or the episode from Star Trek in which the aliens had opposite black/white sides. It's hackneyed, uncomfortable and, in the modern world, unnecessary. I'm glad that, in the end, it's not central to the story. 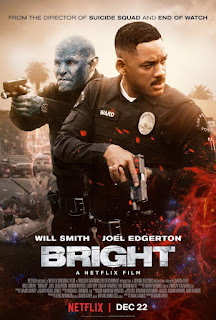 Bright already has a sequel in the works, which I have mixed feelings about. While this works as a one-off popcorn film, the pressure may be on for Max Landis and David Ayers to actually follow this up with a truly good movie - something I doubt either of them are up to. It may be more advisable for Bright to eventually become another one of Netflix's successful series rather than trusting in sequels. As a kid in the 1980s I got to see a number of movies now considered classics when they first hit the theaters. Many of the classic Spielberg films, for instance. What I didn't get to see in the theater inevitably turned up on cable a year later and, with video stores, soon started showing up even sooner. 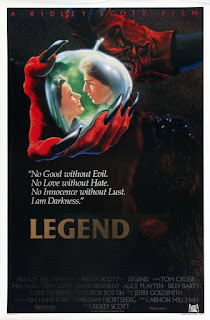 So, why would I have not seen Legend by now? I sometimes do not know who is trying to kill the Star Wars franchise faster: Disney, who currently owns Lucasfilm and the rights to the series, or its so-called fans. When I say Disney, I don't mean the usual complaints that people have of politically correcting the series; I loved The Last Jedi, and am happy to defend it both from those who have a knee-jerk reaction whenever they see a movie has a female lead and the rest who get upset because their fantasies they had playing with toys 40 years ago never made it to screen. I am going to say right from the beginning that I am going to largely be avoiding jumping into a lot of what this movie has to say about race. I know it's an important component of the movie itself, but it is not subtext; it is right there on the surface. There is subtext, I am sure, that I have missed, simply because of a certain obvious reason. 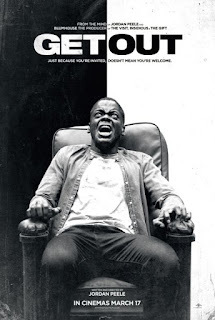 Suffice it to say this movie had enough to it, and successfully presented it, in a way that there are now college courses focusing on the Black experience through horror films. After this paragraph, I will leave all that to people who actually know what they're talking about.